Convened by Congressional representatives Sanford Bishop, Jr, (D-GA), Eddie Bernice Johnson (D-TX) and Anthony Brown (D-MD) and advocates from over three decades, the Braintrust is at the forefront of policy in the House of Representatives, and works together with veteran's advocates to present a strong voice for our deserving veterans of African descent. As a 'voice' for the voiceless and invisible, with over three decades totaling more than 400 testimonies and compelling stories, the 30th anniversary held a very special meaning in terms of lessons learned, life experiences and promoting the role and significance of the Congressional Black Caucus Veterans Braintrust (CBCVB). Built upon the vision and mission to establish a 'voice' in Congress and before the Administration and the advancing of veterans policy and cultural competence, as well as budget related items, the forum provides a unique perspective on issues affecting Black, or African American veterans, their families and communities. "It highlights the myriad of problems, and sheds new light on congressional efforts we must achieve in the 21st century," says Ron E. Armstead, Executive Director, and Ralph Cooper, Co-Founder of National Coalition for Homeless Veterans (NCHV). While convening annually over the past 30 years, this year's Veterans Braintrust featured newly confirmed VA Secretary Robert Wilkie, the Hon. Mark Takano, Vice Ranking Democratic Member of the House Veterans Affairs Committee and honored retired Hon. 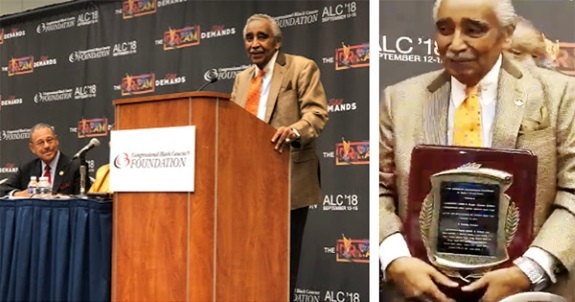 Charles Rangel (D-NY) as Chairman Emeritus, who over the years outlined approaches to help address challenges, eliminate health disparities and achieve racial equity. In addition, the forum highlighted Hon. Joseph DioGuardi who explained and helped policy-makers better understand some of the obstacles involving the posthumous awarding of the Medal of Honor to World War II hero Dorie Miller of the U.S. Navy. He also distributed a news release he wrote to persuade reluctant federal, military and civilian officials. Featured also was scholar Prof. Robert Chester author of the journal article "Negroes' Number One Hero": Doris Miller, Pearl Harbor, and Retroactive Multiculturalism in World War II Rememberance. The CBCVB was conceived and established by Hon. Charles B. Rangel (D-NY) retired as a proactive space, or public rallying place, focus group and platform where sustained advocacy on veterans policies, programs and best practices can and does take place, as well as debate, and public discussion on a broad range of political and socio-economic conditions from a black perspective. The Veterans Braintrust leadership team strives to promote veterans' health and well-being, as well as clear cut information on how to help alleviate and/or remedy long-standing problems of a systemic nature across the nation. To watch the event of the 30th Annual Veterans Braintrust Forum in Washington, D.C. visit www.youtube.com/watch?v=yZMmVyZi1Qw, and/or follow them on Facebook. Established 1988, the CBCVB serves as a think tank, national advisory and advocacy group and is committed to giving 'voice,' and 'advocacy' in order to enhance inclusion, diversity, and opportunity, in addition to improving policies, programs and practices that address the changing demographic profile of the veterans population.